An overall theme we are embracing is Comfort / Fashion. Sounds simple… but extremely important. Themes can get too much about the theme and not enough about the end product. This Comfort and Fashion covers many aspects of our outerwear. Comfort – focus on technical / high waterproofing high breathability…. yet not stiff and restricting fabrics. Focus on the inside of the garment. Neck and face area have extremely soft fabrics, insulation where it makes sense, and less where is does not. Fashion – Bold and Confident styling and prints to be counteracted with fashionable prints that you can make a statement without standing out. One of the trends that influenced the line this year is women’s athletic wear. Big color blocking / Big logo and brand hits. Taking a fashion forward approach to sport luxe design and giving it a twist with a tomboyish look and nostalgic outerwear. The Lindan Jacket – This is a very exciting piece for us, and one that combines the style and attitude of a Nikita girl with current trends and looks in streetwear. 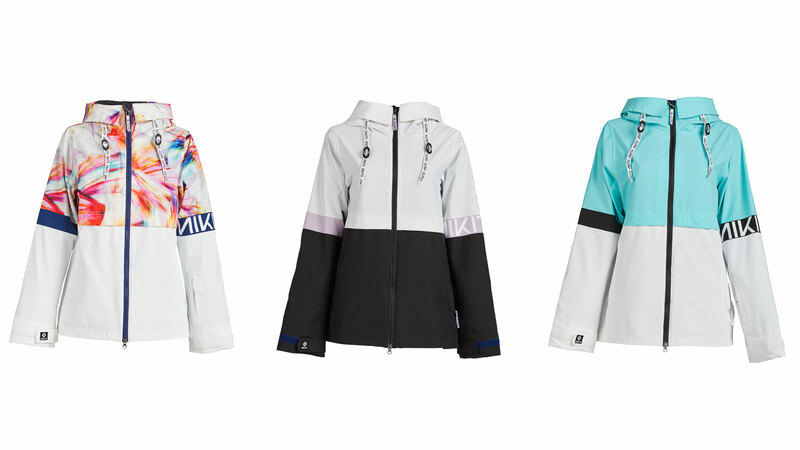 Utilizing our specialty luxe comfort liners this season and pairing that with eye-catching seasnal prints on the outside, this jacket is the complete package for any girl who loves getting outside. White Pine Pant – featured in the new 4-way stretch fabric and offering our new relaxed fit this pant is a stand out for comfort and mobility. 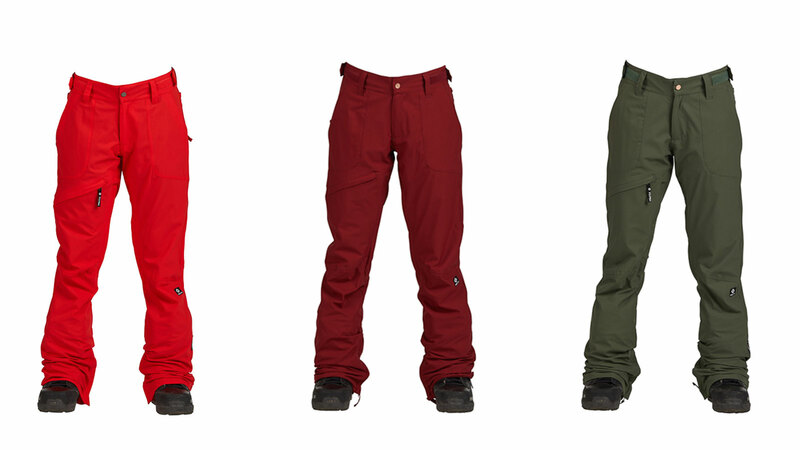 After talking with our retailers it was clear we had a great Slim fit pant but we were missing a more rider friendly pant fit. We gathered more feedback on how we could improve our selection and the White Pine is the result. Looser in the hip, thigh, knee, and hem. I had a hard time choosing between the White Pine Stretch Pant and the Evergreen Stretch Bib -also offered in the 4-way stretch Pinnical fabric but this season we offered it with the drop seat for ease of use when nature calls. Hazel PO Vest – New product to the line this 4-way stretch taffeta pullover vest has side zip entry and is lined in short fur providing the most in luxury and warmth. Kangaroo pockets in the front give you pleanty of room for stashing your gloves or goggles when you go into the lodge. This will be one you don’t want to take off all season. Radio PO Softshell Hoodie – we brought in some new fleece options and the radio is back but with a killer makeover. This 3k 3-Layer Softshell has 4-way stretch providing the best in comfort and mobility. Zippered kangaroo pockets and a sleeve pass pocket make this pullover ideal for any of your needs. I am on the other side of this conversationand I am not sure about where the majority of the sales are coming from we are partnered with a lot of great retail stores and ecomm retailers and distributors and work closely with them through trips like our “Nikita Retreata” to be sure we are getting the best feedback before getting too far into the development process.I know we work to keep our customers engaged through our social media and have had some successful POP shops in the past we will continue to work with our retailers to boost engagment and brand awarness wether it is through our online presence or on the streets working to do events and being present on the ground and in the field. Being present and putting on/sponsoring events is one way to to be sure we are engaging our cunsumer. Our G.W.R event series have been a great way to reach the Nikita customer and we really focus on authenticity and showing our brand in the right places. No on the whole we maintained price point and were even able to add some new products to the line this season. We have been asked to start bringing in a bigger fitting pant, so we added one in. The fit is a compromise between a men’s fit and a relaxed fit we already offer. A little more room in the waist and hips yet keeping a flattering look. Also, we are offering multiple different hood styling. We believe it takes an average garment and makes it something to talk about. We have a convertible hood we are doing, that tucks comfortably in the neck, some oversized hoods that crisscross at the center front…. giving the garment a big cozy feeling, yet technical for the mountain. Pansy flower print will be our FW1920 stand out print. Mountain Fatigue will be a good print for us this season too – an abstract camo. We brought in Lavendar this season and we are getting a lot of positive feedback on that color as well. We brought in a new technical 4-way stretch shell fabric. We have improved our Softshell fabric, and have brought in a new DWR performance fleece. 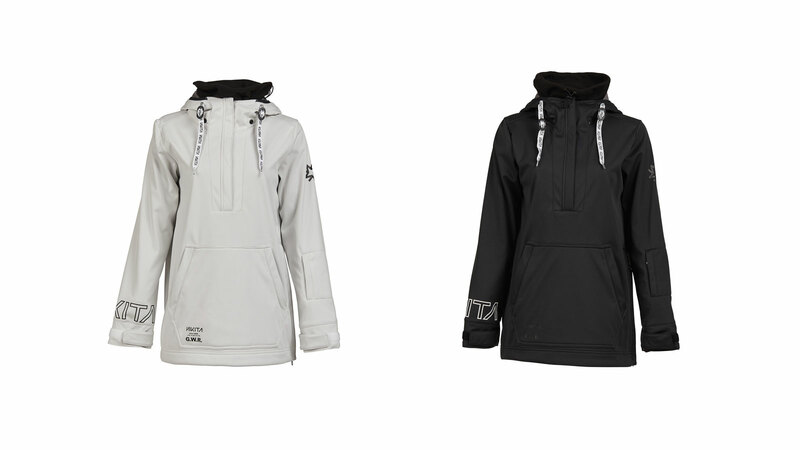 In Cold Weather Parkas we improved our more street inspired look throught 3 new fabrics that suit the category well. Trends we are moving away from are ethnic style prints…. very slim fits. Creating outerwear for Girls Who Ride and always working closely with our team of athletes to make sure we’re connected to what our girl wants. If we aren’t listening to them and their needs, what are we doing? It’s been at the core of Nikita’s heritage right from the start and continues on in the line stronger than ever; Nikita is a brand that was created by girls, for girls. In terms of technical stories, we have created, “The Most Comfortable Jacket” for winter 2019. We enhanced our liners using short fur, super soft brished tricot, and a new ultra suede chin guard makes our jackets feel luxurious and cozy with shells that are ready to perform in all conditions. We are still partnering with Thermore using their Ecodown synthetic insulation which is 100% recycled from PET plastic bottles. Just one of the ways Nikita works to be more eco-friendly. Chikitas continues to be a big story for us, this is our second season for our girls line. We have a strong point of difference that sets our youth outerwear a part from the competion- our Grow With Us system allows for use of the garments for multiple children. With adjustable elastic band pulls allow for adustment up or down by using the provided buttons to set at desired length. No cutting seams – if you get the chance turn a chikitas outerwear garment inside-out to see the system its very unique and different. This season we are offering a base layer category we are calling it Life Layers. There are 2 tops and 1 legging offered in prints from the outerwear line. The lightweight printed fabrics are soft and feel nice against the skin. The prints make them fun and interesting allowing them to stand out on the sales floor. Our prcing is competitive and we are hoping this will be a strong category for us this season. In addition we offer 2 more leggings in a thicker brushed jersey fabric offered with prints featured in outerwear, these could be worn out and about. We also have matching tops- light weight hooded brushed jersey.